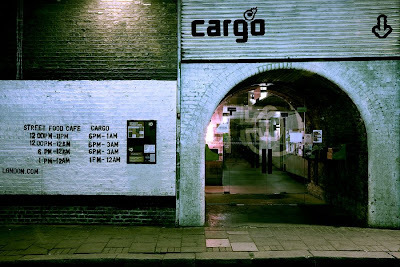 Your author has long been a fan of Cargo as a venue, and it earns a place here even though they do sell a can of San Miguel for £4 because he had another great night there last week. Situated off Rivington Street underneath two arches of the East London Line, the bar and club attracts an eclectic range of bands and DJs and a perfectly pleasant bar, garden and restaurant as well. It's not even all try-hard Shoreditch rubbish and they occasionally have proper bands playing, or even special nights of reasonable quality stuff. The main performance space, beneath the second arch, has a great atmosphere, but is easy to escape if you need a breather. I love the Cargo. You define it very well with that "no trying hard" which clearly all Shoreditch places do. is good for chill out and they also have a great, niche musical agenda. Keep the great work with the blog.